I think it is pretty safe to say that product photography is one of the least artsy kinds of photography. Yes, you sure can make the product look beautiful whether it is the composition, or you can play with lighting to make the shadows look prettier. But at the end of the day, you have a stack of new inventory that need to be photographed and put on sale on the company's website and that is what matters the most. So naturally, I decided to give it a shot. 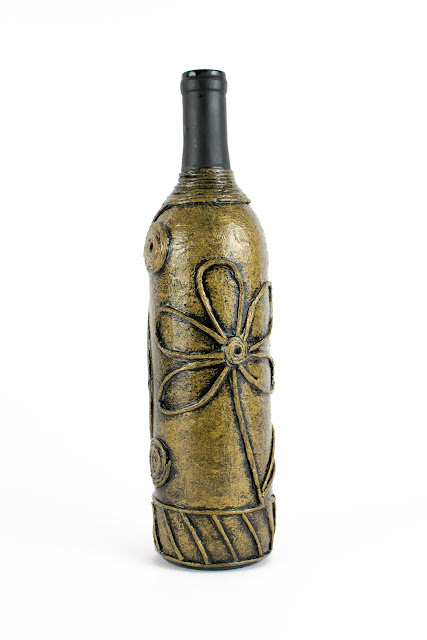 Now, I do not work for any online retailer and I do not "produce" any items myself, so I borrowed a beautiful hand-crafted bottle of wine from my friend that she created together with her daughter (from what I have heard, the offspring was very excited about her mom's little project). As it turned out, it is really simple to create a quite basic product photo: all you need is, well, the product itself, a camera (a DSLR is nice, gives you more control over the settings if you're shooting in Manual mode, but some people manage it even with their iPhones), a tripod, white background and some lights. If you Google product photography, you'll certainly find a few people using desk lamps from IKEA and tracing paper as a light diffuser, but I shot it with a cheap umbrella light kit that I picked up from Amazon a while ago. 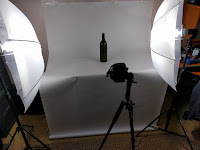 Place the product on the white piece of cardboard or paper (just make sure it is big enough), your lamps in a way so there are ideally no shadows of the product visible, and shoot. Hint: Use a higher F number, so the entire object is in perfect focus. You can use Aperture mode on your camera. Results will vary, but I somehow managed to make a good photo this way. As always, you do need to process the images afterwards, Photoshop being the natural choice for most photographers, and voila!